Euphemia Lawson, daughter of William Lawson and Jean Campbell, was born on 26 Jul 1802 in St Andrews Parish, Edinburgh, Midlothian, Scotland, died on 9 Sep 1878 in the New Town Charitable Institution, Hobart, Tasmania at age 76, and was buried on 11 Sep 1878 in Cornelian Bay Cemetery, Hobart, section A:238c. Known to Edinburgh authorities as honest and decent, Euphemia was convicted and sentenced to death at the Edinburgh Court of Justiciary on 17 December 1827 for throwing vitriol (sulphuric acid) over a neighbour named Archibald Campbell. Her mandatory death sentence was commuted to transportation for her life. Euphemia was living with her husband who was also charged but found not guilty of the same crime. She was convicted in her maiden name which was common practice in Scotland at that time. Euphemia and Hugh lived with William and Sarah on the fifth floor of a tenement building in High Street, Edinburgh. They shared a stair case with their neighbour, Archibald Campbell, who was both a painter and teacher of dancing. He had long been known to Hugh McMillan but bad feeling developed between them as neighbours and a row escalated between Euphemia McMillan and Archibald Campbell, over a chair which had been laid across a doorway to prevent a child from falling down the stairs. Euphemia forced open the door of Campbell’s flat and threw in the offending chair and caused a scene. Campbell reported this to the police who took her away and she had to pay bail to be released. She was incensed by this and threatened revenge upon Campbell. Witnesses heard her threaten to throw vitriol over his coat. The court’s 250-page precognition file leaves little doubt that she did extract a revenge and that she did throw vitriol at Campbell as he passed her doorway. What remains in doubt is whether, as she claimed, she only intended to damage his coat or whether she intended to harm him personally. Lord Ellenborough’s or the Malicious Shooting Act was introduced in the United Kingdom in 1803 to clarify the law relating to abortions and certain other offences. 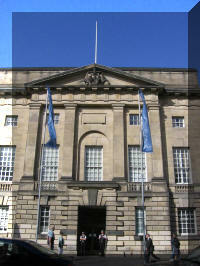 It was extended to Scotland in 1825 in response to growing civil unrest as the Industrial Revolution saw an increase in assaults and civil disobedience. However, it included a unique provision that provided for a mandatory death sentence for those convicted of throwing vitriol (sulphuric acid), which had apparently become common. Euphemia and her husband Hugh were both charged with throwing vitriol and with murder. She was charged in her maiden name as was common practice in Scotland. 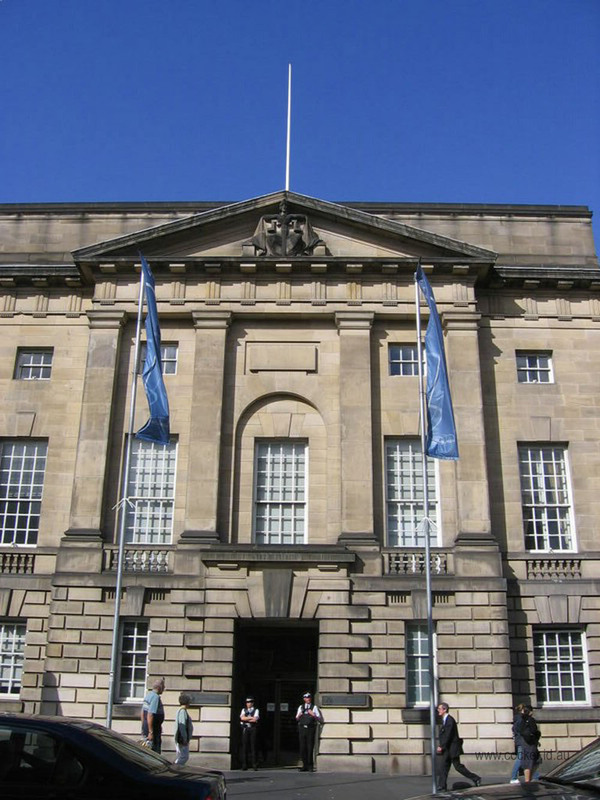 Both murder charges were dropped and Hugh was found not guilty but Euphemia was found guilty of throwing vitriol and she received the mandatory sentence of death at the Edinburgh Court of Justiciary on 17 December 1827. The jury strongly recommended mercy but she was sentenced to be executed. This was later commuted to banishment for life, largely because it was the first conviction under the new statute. One of the consequences of Euphemia McMillan, nee Lawson, being the person to be tried under this act was that the trial was well documented, analysed and commented upon. On 7 May 1828, the Borneo set sail with Euphemia and 73 other female convicts, all banished to Van Diemen’s Land. The Borneo was a ship of 428 tons built in Borneo in 1817, class E1. It departed London on 11 May 1828 with 73 female convicts of whom 3 died on the journey. The ship visited Madeira and the Cape of Good Hope, presumably to collect water and fresh food as well as cheap spirits. There were also 21 women, most of whom who were travelling to rejoin their convict husbands, and 49 children. The ship arrived in Hobart Town, Van Diemen’s Land on Wednesday 8 Oct 1828 following a journey of 150 days. The Master was Richard M Whichilo and the Surgeon was Oliver Sproule. The vessel required extensive repairs at Hobart due to damage sustained following departure from the Cape of Good Hope on 27 Aug 1828. Consequently it was at anchor in Hobart Town until 19 Dec 1828 when it then sailed to Sydney. The two children, William aged about four and Sarah aged about two, accompanied Euphemia and they arrived at Hobart Town on 8 October 1828. 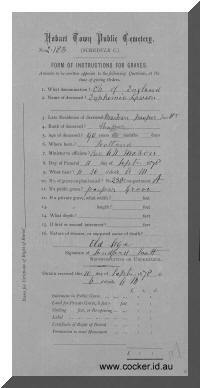 Both children were admitted the Orphan Schools at New Town shortly thereafter. Her gaol report stated that she had a violent disposition in temper and conduct although it was very much improved since convicted. Her connections were decent; she was well instructed when young and bore a very good character for honesty and decency when single and in service. Never accused of any crime previous to that of which she has been convicted. 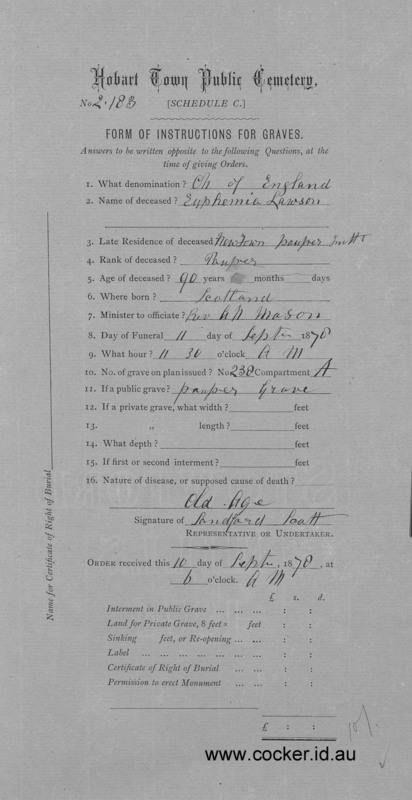 Euphemia’s convict records state she was twenty-six years of age, 5'1" tall and a housemaid and laundress by trade. Fair complexioned with a small head, dark brown hair and grey eyes: a narrow and oval face with high cheek bones; she was pock pitted with a large pockmark in the centre of her chin. Her forehead was small, round and full; her eyebrows small and arched: her nose straight her mouth large and full and her chin was small with an indent on the point. Her good record as a housemaid and laundress may have contributed to her first assignment being to Government House, but it was not to last long. In June of the year of her arrival she was returned to the Female Factory cells on “seven days bread and water” for being intoxicated. Then began a cycle of drunkenness, petty offences and rebellion, appearing before a magistrate 28 times and receiving a total of over ten years’ additional prison time, much of it hard labour. Her full conduct record paints a picture of a sad and violent life. Euphemia showed all the signs of a deeply troubled person who erupted under the influence of alcohol. On 3 Feb 1837 she gave birth to a daughter, probably fathered by convict Edward Griffith, whom she later married. She was forced to wean her baby, Ann, so that Ann could be placed in the Female Factory prison nursery and then on 10 Mar 1838 she was charged with "appearing drunk at the Female House of Correction, where she had permission to see her child". Edward Griffith arrived on board the London in 1832, having been convicted of stealing by picking pockets and was initially assigned to James Triffit at New Norfolk. Euphemia married him at St Matthews Anglican Church New Norfolk on 23 November 1840 and was able to retrieve her daughter Ann. Her life could have taken a lasting turn for the better but she was unable to stop drinking and, despite warnings, her ticket of leave was cancelled. In January 1844 she was returned to hard labour in the Female Factory for drunk and disorderly conduct and Ann, aged 7, was placed in the Queens Orphan School on 6 March 1844. Then, in 1846, nearly twenty years after she arrived in Hobart Town, Euphemia was charged with attempted murder. Euphemia Griffiths was indicted for stabbing and wounding Mary Worster, with a fork, with intent to kill and murder the said Mary Worster, at Hobart Town, on the 21st of November last. A second count charged the offence, with intent to commit some grievous bodily harm. On the day laid down in the indictment, the prosecutrix was sitting sewing on the stairs, in the house of a Mrs. Sullivan, when the prisoner entered the house with a fork in her hand, and went towards the prosecutrix, and stabbed her with the fork immediately under the left breast. She then retreated to the door, and was again returning to the prosecutrix, brandishing the fork, when a woman named Mary Hughes came to her assistance, and wrenched the fork out of the prisoner's hand. Dr. Bright deposed that he attended on the prosecutrix, on the 21st of November; she complained of pain under her left breast; he examined her breast, and found two small punctures, such as would be inflicted with the prongs of a fork; there was a small quantity of blood about the sixth, seventh, and eighth ribs; the instrument had struck the seventh rib; had it passed between the seventh and eighth ribs, instead of being arrested by the seventh, it would have penetrated the heart, and produced death, the prongs of the fork were bent; did not probe the wounds, nor compare them with the prongs of the fork, because the fork was not shown to him for several hours after he examined the woman. His Honor, in putting the case to the jury, remarked, that this was another bad case, arising out of intemperance. The jury found the prisoner guilty on the second count, and recommended her to mercy. The sentence of death was recorded against her. She received a remission having, served less than four years of her sentence and was reassigned in 1849 but she was returned after only a couple of months for again being drunk and absent. And so the cycle continued. Somewhat surprisingly, she was granted another Ticket of Leave in July 1858, but the pattern of alcohol fuelled dereliction was firmly entrenched and at the age of 62 and after six further offences in as many years it was revoked in April 1864. Her final appearance before Court was on Saturday 1 April 1871. Before the Stipendiary Magistrate and Mr. James Ralfe, J.P. Idle and Disorderly,-Euphemia Lawson, an old female, who gave her age as 75, was charged with being idle and disorderly on the 31st ult., in wandering on the wharf and having no means of subsistence. Constable Meredith said the defendant had been three days out of the Invalid Depot, and on the previous day he found her drunk on the wharf. Her friends would have nothing to do with her. The defendant said she had left the depot to attend a relation who was near her confinement. She was sentenced to six months' imprisonment with hard labor, the Stipendiary Magistrate remarking that she would be placed in the Hospital. In 1876 Euphemia was discharged from the New Town Charitable Institution to her daughter Ann’s care but she was returned when Ann was sentenced to three months’ gaol in September 1877. She was still a convict when she died at the New Town Charitable Institution on 9 Sep 1878, aged in her 70s, and more than 50 years after she was originally convicted.